Cancellations made seven (7) or more days prior to the date of arrival will incur a 10% charge. Cancellations made less than 24 hours (1) day prior to the arrival date will incur a 100% charge. Certain types of reservations (promotional rates and weekly rates) are non-refundable will incur a 100% charge. If a weekly rate reservation does not complete the minimum stay of 7 nights, the rate for each night will revert to the current daily rate. A refund, if indicated, will be calculated on the number of nights stayed at the prevailing daily rate. There are no refunds for early check-outs and “no shows”. If the number of guests on your reservation is reduced once the reservation is paid it is up to the hotel to determine applicable refunds or penalties. All guests and visitors to the hotel must be at least 18 years of age and possess valid identification (state ID card/driver's license, passport, or some other ID that has a picture and date of birth). Minors and minor children accompanying parents/legal guardians do not require ID. Exterior doors are secured at approximately 10 PM nightly. Blocking the doors open is never permitted. Quiet Hours are from 10 PM to 7 AM, daily. Please be considerate of others and avoid slamming doors. The Ingra House Hotel is a non-smoking building. Absolutely no cooking, smoking, or open flame of any kind in guest rooms. There is zero tolerance for illegal drug use or related activity. There is zero tolerance for domestic disturbances. This policy is strictly enforced. No alcohol is permitted outside of the rooms. Absolutely NO unregistered visitors after 10 PM. This policy is strictly enforced. Room trash goes in the dumpster out back. Please don't put it in the kitchen wastebasket. Always turn the fan on and run it when you're in the bathroom. Every time. Kitchens are open from 7 AM through 10 PM. When using the stove, close the kitchen door and turn the fan on high. Every time. Pots, pans, utensils, and all cooking items are to remain in the kitchens – please do not take to your room. Stay with your food; do not leave unattended food cooking on or in the stove. Please clean up after yourself. Housekeeping is not responsible for guest dishes and pans. Welcome to the best budget hotel in Anchorage, Alaska. We make uncommon hospitality common. 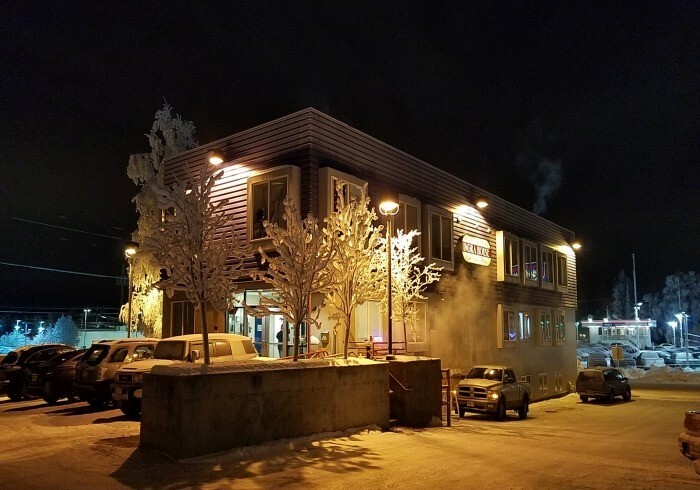 The Ingra House Hotel is a European-style budget hotel located in Anchorage, Alaska, walking distance from the downtown center. We offer secure, clean, and quiet accommodations on a daily and weekly basis. In 2005, the building was rebuilt into a three-story, forty-room facility. There are three community kitchens and six shared private bathrooms for the use of our guests. We offer accessible restrooms, roll in showers, and a lowered sink in the kitchen. We also have a coin-op laundry facility on site. Each room comes fully furnished with a bed, linens, table and chairs, built-in wardrobe, and a large refrigerator. All of our rooms have 27" or larger televisions with 90 channels of digital cable and 7 premium channels of HBO. Secure hi-speed wireless internet is available throughout the hotel as well as local telephones for guest convenience. Our level of service and dedication is unmatched in our segment of the marketplace. Ingra House is owned, staffed, and managed by lifetime Alaskans with many decades of experience of travel and adventure in the Last Frontier. The on-site general and assistant managers are veterans of four branches of the US military and are committed to ensuring a safe secure environment for all, regardless of time of day. Experience an uncommon level of Alaskan hospitality, knowledge of activities and local flavor, all in a unique setting only Ingra House delivers to the marketplace. Ready to begin your adventure in the land of the midnight sun? We also offer an extended stay (weekly) rate at a substantial discount off our budget-friendly nightly rate. Just enter a seven-night stay and check out the savings! Did you know that Alaska is the most northern, western, & eastern state, longitudinally, in the United States? It also has two time zones, Alaskan and Aleutian time, two of the seven US time zones. Yes, there's seven.